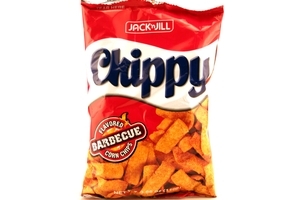 Jack n Jill Chippy BBQ Flavor in 3.88oz (110g) pack. Product of Philippines. Corn, palm oil, barbeque flavor [natural and artificial flavor enhancer (monosodium glutamate), salt, sugar, hydrolized soy and corn protein, acidity regulator (calcium phosphate tribasic), rusk powder, maltodextrin, silicon dioxide as anticaking agent, caramel color, vegetable oil (sunflower oil, palm oil), riboflavin or lactoflavin as colorant],irodized salt, monosodium glutamate, onion powder, garlic power, pepper and antioxidant (butylated hydroxyanisole, butylated hydroxytoluene, propyl gallate).